Set in Zurich in the 1950s, a special agent who is near retirement receives a major assignment: Bring down Harry Wind, a top PR manager who has been accused of spying. This is another solid drama based on a Bernhard Schlink novel. Similar to The Reader (2008) the protagonists are confronted with the consequences of what they've done and what they should or shouldn't have done. 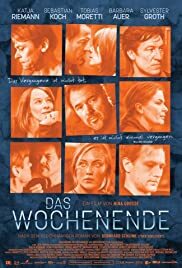 Das Wochenende chooses the story or RAF (German leftist terrorist group) as it's historical background. This somewhat forgotten chapter of recent German history is obviously not as potent as The Reader's WWII burden. The movie lacks any explicit or scandalous content, leaving us with the story and a strong performance of all cast members. Nina Grosse uses these as a tool to confidently carve out the film's niche in the given artistic framework. The film starts with a former RAF member leaving prison after a lengthy sentence carrying some personal belongings and a couple of German Marks. Welcomed by his sister, he spends a weekend in the country with some old friends. During the weekend he'll encounter the world of Germany within the EU with it's new currency and consumer mentality. With increasing tension the protagonists reveal more of their true selves. They are to learn more about themselves and their relationships.